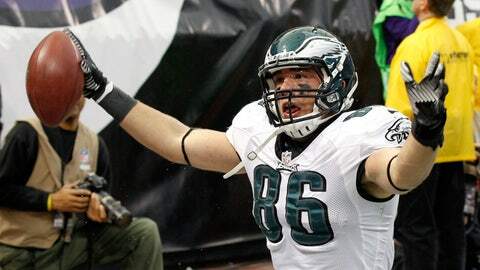 Should Zach Ertz have been credited with a touchdown? But a play I saw in the Philadelphia-NY Giants game got me to thinking about something that really hasn’t been talked about much to this point — the notion of taking replay and putting it into the NFL’s Central Command Center in New York. And I really like the idea. Here was the situation: Philadelphia had the ball, first-and-goal at the Minnesota 3-yard line with :32 seconds left in the third quarter. Minnesota led 27-16. Eagles quarterback Nick Foles lobbed a pass into the back of the end zone to Zach Ertz, who was being defended by Andrew Sendejo. Ertz caught the ball with one hand and as he was going to the ground, held onto the ball near the end line. The play was ruled a touchdown on the field and after a booth review, the ruling was confirmed. 1. Once a coach throws a challenge flag, then the decision on the challenge is then made in New York.